Anti-police activist the Rev. 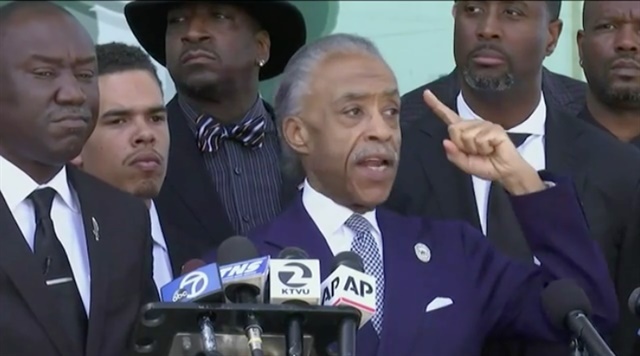 Al Sharpton traveled to Sacramento Thursday to to speak at Stephon Clark’s funeral. Clark was shot and killed March 18 by Sacramento police officers who reportedly mistook his cellphone for a gun in a low-light confrontation. This week White House spokesperson Huckabee Sanders said the shooting was a "local matter" when asked about it by a reporter. "No, this is not a local matter," Sharpton said at Clark's service. "They've been killing young black men all over the country, and we are here to say that we're going to stand with Stephon Clark and the leaders of this family. … This is about justice. This is about standing with people with courage." After the funeral, Sharpton stood outside the church to address a gaggle of reporters. "There is no way that we can understand why an unarmed young man in his grandmother's backyard, five feet from where she sleeps, was shot at 20 times and killed," he said. Sharpton said that police could have knocked on the door or called for backup, the Los Angeles Times reports. "Why was the immediate thing to draw lethal force?" Sharpton asked.